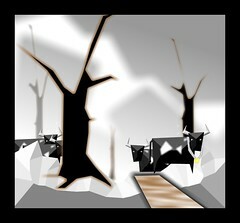 Cattle from "In The Winterlands"
This was part of the imagery for a song, mircopera thing that got shelved still liked the art from it though and this was one part of a 4 part relative set. Thanks to custom vector brush there are a whole lot of people in this vector painting. Maybe your are "one" of them:) I hope so. 2. Got some tennis in this morning before it got to hot. One must complete such things really early in the summertime here. 3. Got the official National Association of Teachers of English list of Authors the other day. Thankfully Wordsworth is on it so that could be another positive for the album if I use dominantly his texts. I think I like his texts for lyrics because there is a strong connection to the miracle of nature and mans presence within it in his works. 4. 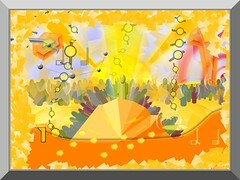 Still debating the overall music theme for the 2009 album. I’m going back and forth between; Piano and voice, Epic, or Vocal Trance. The Wordworth lyrics may be a bit deep for vocal trance but everyonce in a while that style has some nice lyrical surprises. 5. I also picked up some Longfellow from the Library and was pretty shocked to see he is not on that list of required college reading. He was listed as a great in my old World book collection though. (Man I’m glad I came into that ol’ set of world books. Wikipedia is awesome but there is just so much magic in grabbing an encyclopedia randomly and flipping it open. Very good for solid ideas and inspiration. If you have the space and see someone unloading a set on Ebay for $5.00 or something, heck, get ’em! Especially if you have kids. I am really, really thankful Mom picked these up for us when we were kids. I loved them then and still love them now. 8. I realized today I can’t stand “sound-alike” marketing even if I like the artist. I would like to find a way to just present my true original works and have it find its own audience. This has happened sporadically but not enough so far to have it be my only means. 9. The official rule for Flash Fiction is 1000 words or less. 10. Almost up to 100o followers on Twitter which I just got into for real about a month ago. Nice! Follow?